Sie haben eine Frage zum (122 m²), 3 Schlafzimmer und 1 eigene Badezimmer in 2. - Louvre - Börse (Place des Victoires)? Classy yet cozy, the 3-bedroom Place des Victoires is a spacious vacation apartment in the bustling Les Halles neighborhood. 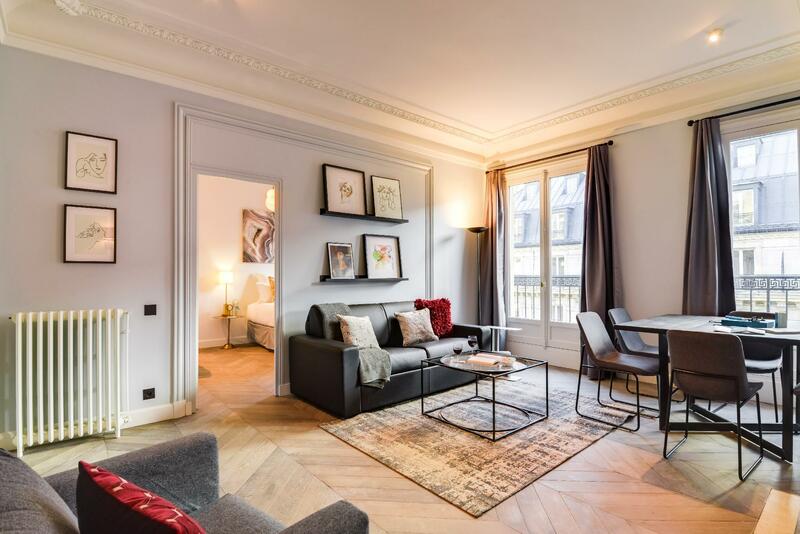 Located in the 1st arrondissement, near the famous Palais Royal and the Musée du Louvre, this apartment is in the timeless heart of Parisian culture. All the classic sights are within walking distance: the iconic Louvre Pyramid (15 min), the Arc de Triomphe (14 min), and the Pont de Arts bridge (15 min) over the Seine River. Restaurants and chic cafes are everywhere, and the Sentier and Les Halles Metro stations are within a 6-minute walk. Inspired by the glamour of Paris, our local interior designer has crafted a sophisticated, understated space. Flowing drapery, picture windows, and stately wooden floors give this apartment its elegance; colorful accents add a whimsical touch. The open-plan living area invites you to kick back and relax, and a fully equipped kitchen is perfect for in-house dining. Premium amenities include free WiFi, cable TV, hotel beds and linens, luxury toiletries, and a Nespresso machine. Families and groups will love this urban hideaway in Paris.